In a frank discussion earlier this year over music with friends, one of them cheekily said: “What has The Beatles ever done for music?” . To say things got a little more heated after that comment would be the understatement of the year, but his question was serious. Ron Howard‘s The Beatles : Eight Days A Week-The Touring Years will go some way to answering that question. The meteoric rise of The Fab Four, who redefined popular music as well as liberating the youth from the confines of conservative post-war society. The fascinating documentary that follows John, Paul, Ringo and George make their first steps into musical Valhalla, USA. When Bands Release albums we take it for granted a major tour will follow. 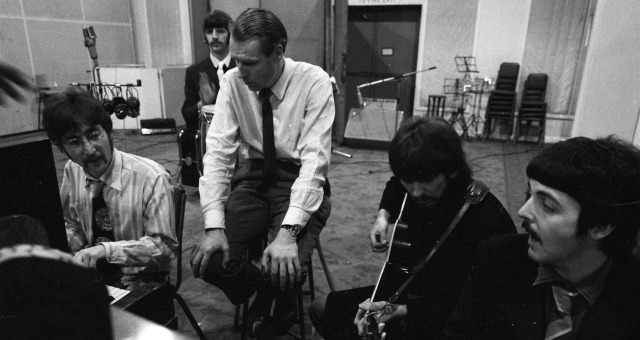 The Beatles may have released 13 Studio Albums amazingly their touring years were short-lived. Despite the short time, they were monumental chapters in the bands and musical history. They wanted to start a ‘revolution’ and they certainly did that. The Beatles: Eight Days A Week-The Touring Years is the first documentary officially approved by the band since they broke up in 1970. Exploring the band through their concert performances, from the early days of the Legendary Cavern Club Liverpool, the Strip bars in Hamburg. To the giant steps into stadium gigs around the world from New York to Melbourne, Tokyo to London, euphoria has struck the world and it’s called Beatlemania. “It’s not a culture, it’s just a good laugh” utters Paul McCarntey. Whilst history unfolded around the boys amidst the chaos of superstardom, the touring felt endless draining at times. However, as Beatlemania roamed wild they finally got the ‘golden ticket’ a slot on The Ed Sullivan Show the gateway to the world, the rest is history. When you look back The Beatles were essentially the world’s first true Boy Band, the first band to play to stadium shows, they even had their own films ( starting with A Hard Days Night in 1964). We also mustn’t forget the band also broke so many Billboard chart records including five successive number ones. This film doesn’t offer interviews with adolescent celeb fans from some manufactured pop poop pretending but true celeb fans like Whoopi Goldberg and Sigourney Weaver who saw the Fab 4 in person. Amazingly Howard finds video footage of a screaming young 14-year-old Weaver at a show which gives the fans cherished memories a massive seal of authenticity. The Beatles: Eight Days A Week – The Touring Years really captures the chaos of the moment, the intensity of the touring, the songwriting, album creation. Whilst a lot of the archived footage may be familiar to fans Ron Howard has the remaining Beatles blessing which gives him a key to some truly awesome unseen footage. This gives us a more human side to the band, a side of the band we sometimes forget. Appreciating 4 young guys loving their craft, loving the exposure, overwhelmed by the awe if the screaming fans. Nowadays bands take it for granted been in Charts, appearing in shows, fans singing their songs, but take a step back to the 1960’s. The amazement fo the guys hearing their new song on the radio or even hearing The Kop at Anfield Stadium fans singing harmoniously to of their songs overwhelmed with emotion. The Beatles: Eight Days A Week – The Touring Years doesn’t attempt to analyse the factors of how and why they became one the greatest bands ever. It just asks you to step back and watch these artisans do what they did so well, ‘having a laugh’ whilst you reminisce in ‘I was there’.